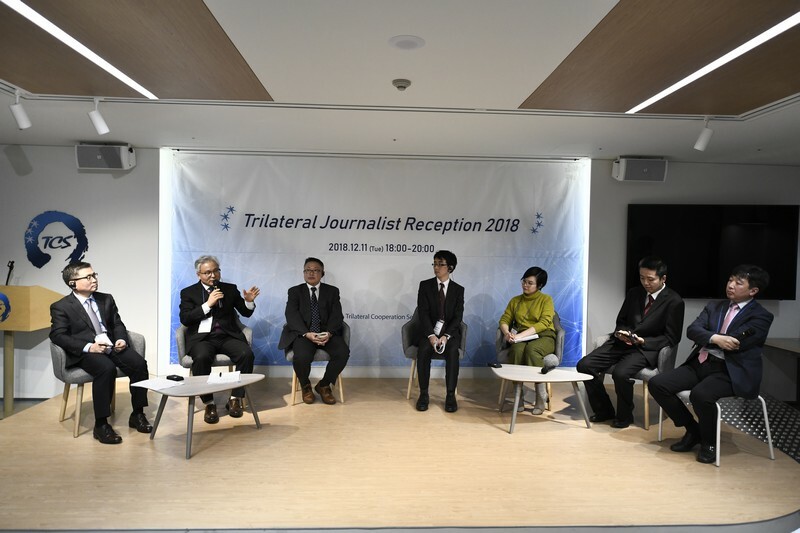 The Trilateral Cooperation Secretariat (TCS) organized a trilateral journalist reception on December 11th (Tue), 2018 at the TCS international conference hall. This reception was specially prepared to commemorate the 10th anniversary of the first Trilateral Summit Meeting between leaders of China, Japan and Republic of Korea in December 13, 2008 at Fukuoka, Japan, and also, to celebrate the biannual hosting of Olympic Games in Pyeongchang/ROK, Tokyo/Japan and Beijing-Zhangjizkou/China since 2018 to 2022. The TCS also hosted a photo exhibition to celebrate the 5th anniversary of Trilateral Journalist Exchange Program (TJEP) organized by the TCS since 2014. On the reception, over 60 C-J-K journalists including TJEP alumni, Chinese and Japanese correspondents in Seoul, and ROK Foreign Ministry correspondents, and also, scholars and diplomats including Mr. NOH Kyu-deok, Spokesperson of ROK Ministry of Foreign Affairs, Mr. NISHIOKA Tasushi, Director of Japan Culture Center in Seoul, and Mr. CHEN Shaochun, Minister counsellor of Chinese Embassy in Seoul participated as a representative of each government. 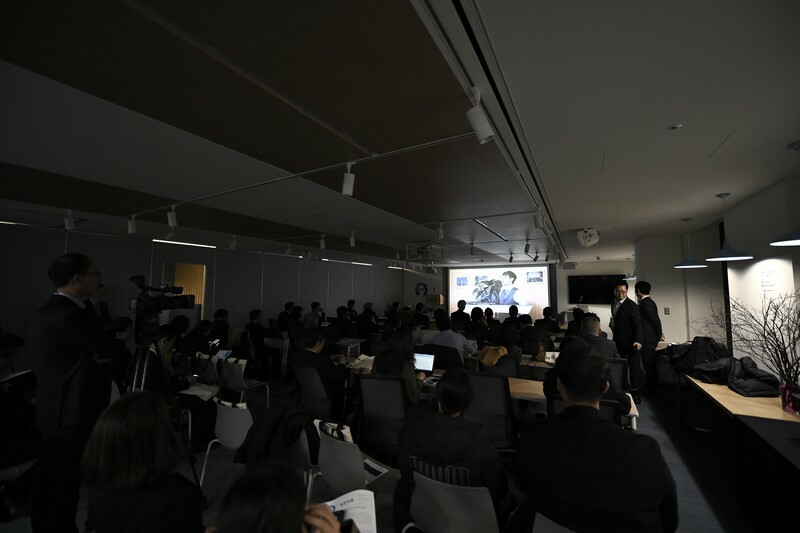 Overall event was consisted of Summary video of the Trilateral Statistics on Public Opinion survey outcome, Opening remarks of the TCS Secretary-general, Mr. LEE Jong-heon, Keynote speech of Mr. NOH Kyu-deok, and trilateral journalists round table followed by networking reception with C-J-K dishes and liquors. 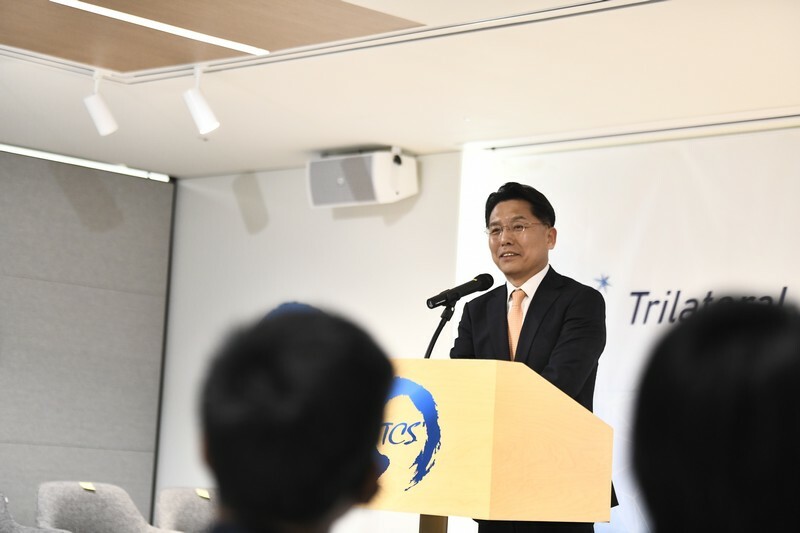 Utilizing this precious opportunity, the TCS announced the trilateral simultaneous public opinion survey outcome organized by the intergovernmental organization for the first time. On this survey the TCS increased credibility of analysis result by gathering 3,000 samples (1,000 samples from each country) through a telephone survey methodology and also reflected concerns of each country by drafting the questionnaire based on Delphi-analytic method in cooperation with over 30 C-J-K professionals. The TCS requested the Kantar Public, an international public survey company in charge of annual European Union public survey (Standard Eurobarometer), for the implementation of surveys in each country. Based on the survey result consisted of total 28 questions, the TCS surveyed three major curiosities. Namely, the present mutual perceptions on the neighbors, perceptions on trilateral cooperation, and outlook of the trilateral cooperation. On mutual perception, around 30% of respondents answered as they are feeling familiar to the neighbors. Result of trust on each other was somewhat similar, however, Chinese respondent showed higher trust on Japan and Korea. Despite the low rate on mutual perception, respondents proved confident beliefs on the potential of trilateral cooperation. More or less 80% of respondents in each country responded as it will be beneficial for the three countries if it will be achieved progressively. Also on the necessity of cooperation, respondents strongly agreed on the necessity of trilateral cooperation apart from bilateral relations. All respondent groups showed over 80% agreements on it for the future-oriented perspective. On the current progress of trilateral cooperation, majority of Japanese and Korean showed dissatisfaction, while, nearly half of Chinese respondents evaluated the current progress positively. Also, more than 40% of respondents believed the trilateral relationship as competitive rather than complementary. More than 2/3 of the C-J-K respondents showed positive perspective on the question asking whether the trilateral cooperation can be extended to the regional cooperation with neighboring countries in Asia such as Russia or Mongol. 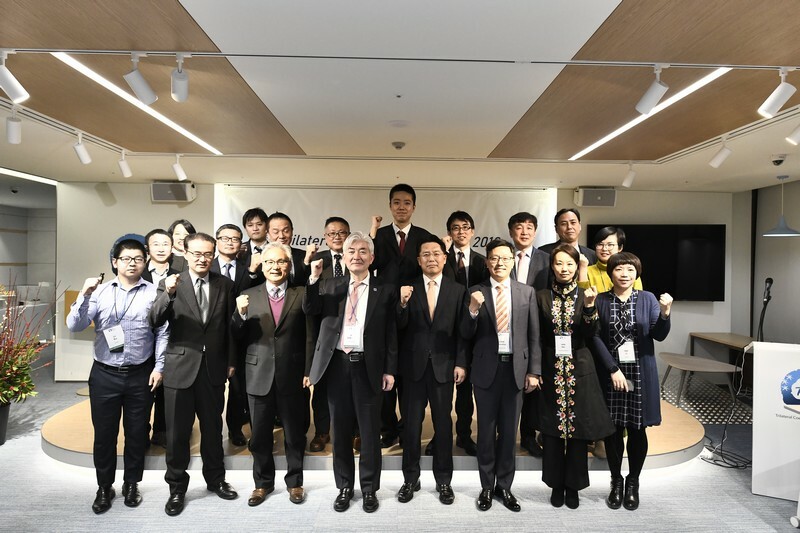 As for the area needs trilateral cooperation, respondents showed interests on ‘the cooperation for air and pollutions’, ‘establishment of economic cooperation system’, and ‘joint development of eco energy’. As for effective measures to promote cooperation, respondents chose ‘regularization of Summit Meetings and expansion of intergovernmental cooperation’ as most effective measure. On the question asking major source of news and information on other two countries, more than half of the respondents chose Online or SNS. This tendency was more distinct from China, however, in Japan and ROK, TV was still more important source of information. In Japan, papers were still considered as one of major sources. 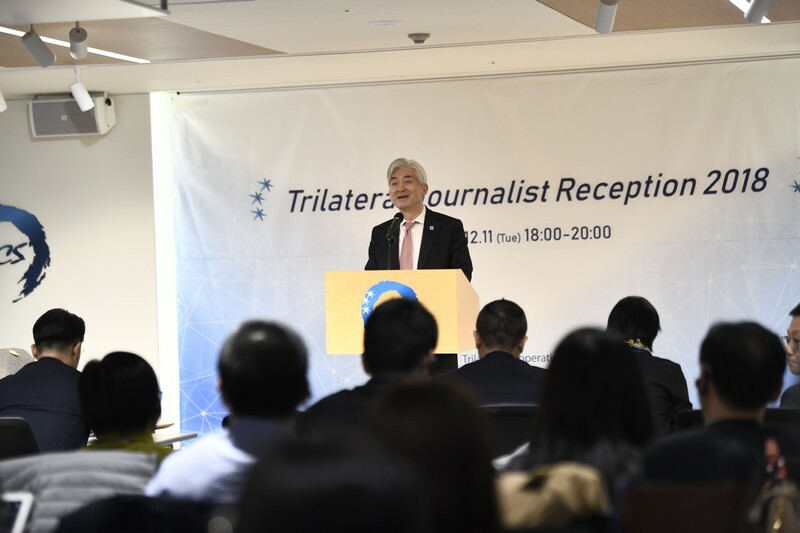 The TCS Secretary-general, Mr. LEE Jong-heon expressed a deep sense of gratitude to the journalists from the three countries who devoted their efforts and attentions to mutual understanding and promotion of trilateral cooperation. 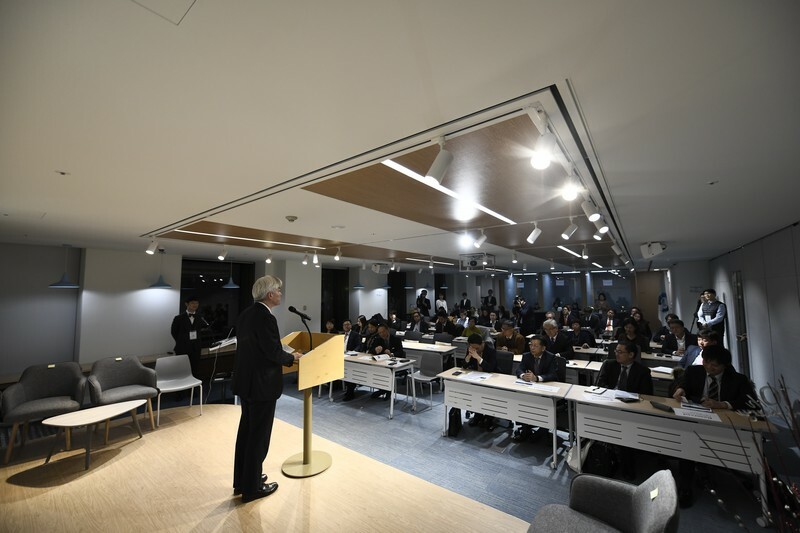 Without their endeavors, he mentioned, trilateral cooperation could not develop to the current level in between ups-and-downs of bilateral relations during last 10 years. Asking for continuous supports and attentions to provide a momentum for Northeast Asian peace and co-prosperity, he reaffirmed the TCS’s utmost efforts to contribute more to the promotion of trilateral cooperation based on the outcome of this trilateral public opinion survey and concrete network between the C-J-K journalists.